Lynne Marsh’s installations straddle the line between reality and simulation. 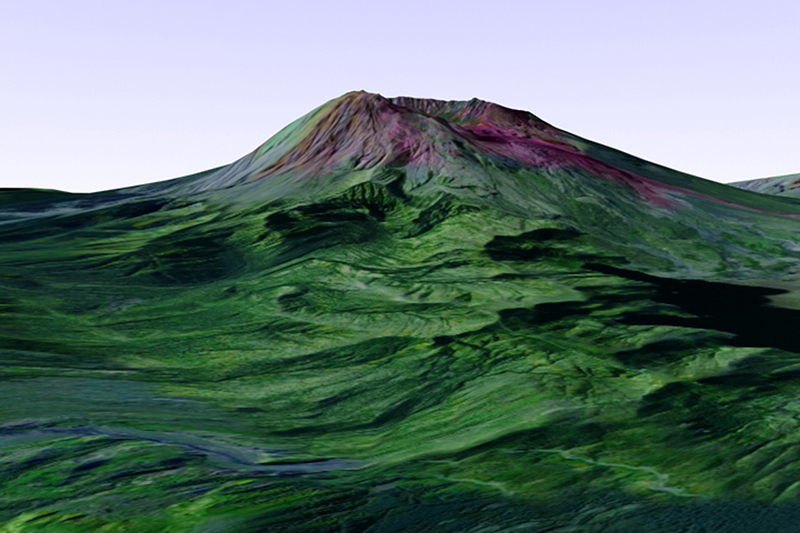 In Crater, old and new technology results in the physical simulation of the crater in Mount St. Helens, an active volcano near Seattle, Washington. A soundscape and a luminous virtual landscape provide the spectator with an encompassing sensory experience, as well as questions about the authority of reality. Crater prompts the spectator to consider their potential to explore both physical and virtual spaces. Lynne Marsh is an interdisciplinary artist whose practice merges digital video, 3D animation, performance, and sound. Since 1993 Marsh has been producing work that addresses representation mediated through technology and simulation. She is particularly interested in the convergence of speculative fiction; fashion; and the political, social, and imaginary stakes of territorial exploration. Marsh’s installations have been presented in numerous solo and group exhibitions in Canada, the United States, the United Kingdom, and Europe. She completed a Bachelor’s degree at Concordia University and a Master’s degree at Goldsmiths’ in London, UK. She currently teaches at the University of Hetfordshire. Marsh lives and works in both Montreal and London.